LITTLE EGG HARBOR, NJ – Starting in the summer of 2017, the roof at Pinelands Regional High School (PRHS) was replaced. (Here is Citizens’ Media TV’s full coverage.) The decades-old asbestos containing materials on the roof were – and still are – being replaced with a modern “built-up” roofing. Although dangerous during the first hours of application, these more modern materials are safer in the long term. Please support independent journalism. Buy a Citizens’ Media TV t-shirt. On July 26th, asbestos debris was found at “seven locations” on the roof. According to that day’s “Job Site Inspection Daily Field Report,” Bob Law of Mike Kobithen Roofing and Insulation stated (to the author of the report, WTI Tech Inspector Harry VanSciver) that they would not clean the old and potentially life threatening contaminants. Instead, Kobithen decided they would “encapsulate” the asbestos by applying the new roofing material on top of it. 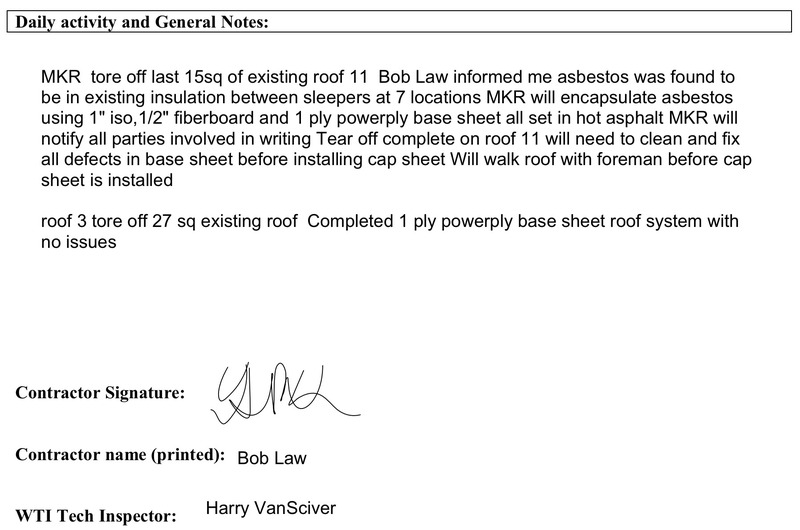 According to the July 26th report, the asbestos in these “seven locations” was discovered “between the sleepers.” This implies that the debris was not directly on the roof but rather underneath it. The rooftop of PRHS is flat and covered with corrugated metal panels. The panels are supported by wooden beams called “sleepers.” (A more common version of sleepers are the wooden beams supporting the metal rails of train tracks.) The sleepers are likely supported by steel beams. The asbestos debris was therefore found sitting on those steel beams. Trapping the asbestos from the top side meant that the only way for it to be cleaned or dealt with, was from within the rooms underneath. It is currently unknown specifically where these “seven locations” refer to, and who ultimately gave permission to roof over the debris.